On November 19, 2013, SPRING hosted the Ag2Nut Community of Practice Webinar presentation by Jim Levinson, Yarlini Balarajan of UNICEF New York, Alessandra Marini of the World Bank, and Etienne du Vachat of Action Against Hunger (ACF). The presentation featured highlights from the report: Addressing Malnutrition Multisectorally: What have we Learned from Recent International Experience? (PDF, 2.8 MB), which was commissioned by the UN's MDG Achievement Fund. 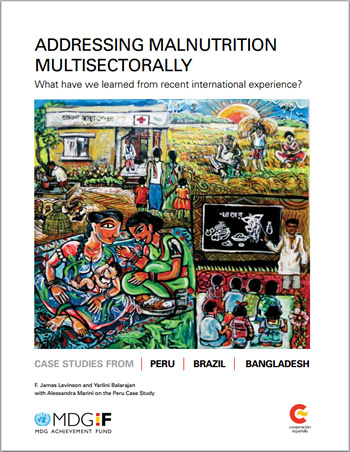 The document reviews multisectoral nutrition activities in several countries and includes major case studies from Peru, Brazil, and Bangladesh—countries that have wrestled with multisectoral nutrition for at least a decade. Major conclusions of the report relate to the importance of multisectoral convergence in vulnerable areas, to the importance of civil society advocacy, and to the value of results-based incentive to local areas. In addition to this overview, the presentation focused on the Peru experience and ACF’s recent publication Sowing the Seeds of Good Nutrition, featuring case studies conducted by ACF on nutrition considerations in agricultural policy in Peru, Kenya, and Burkina Faso. The ACF report draws on the AgN-GLEE Landscape Analysis Presentation and illustrative intermediate indicators along the Agriculture-Nutrition Pathways. SPRING also hosted a brownbag presentation with Dr. Levinson featuring an in-depth presentation on the Addressing Malnutrition Multisectorally: What have we Learned from Recent International Experience? report. Access the screen cast on Agrilinks.